This week’s mystery movie has been the 1957 MGM picture “Edge of the City,” which was Martin Ritt’s debut as a film director. It starred John Cassavetes (Tuesday’s Back of the Head Guy), Sidney Poitier (Friday’s mystery guest), Jack Warden (Friday’s mystery guest), Kathleen Maguire (Wednesday’s mystery guest), Ruby Dee (Thursday’s mystery guest), Robert Simon (Monday’s mystery guest), Ruth White (Wednesday’s mystery guest), Val Avery (not shown), William A. Lee (not shown), David Clark (not shown) and Estelle Hemsley (not shown). It was written by Robert Alan Aurthur, with music by Leonard Rosenman and photographed by Joseph Brun, with titles by Saul Bass. The producer was David Susskind in his first venture into film. “Edge of the City” was shown in Los Angeles as the second half of a double bill with the now obscure film “Lizzie,” which starred Eleanor Parker. Monday’s mystery fellow is taking a call. Update: This is Robert Simon. Tuesday’s mystery guest has a rather battered hat. And just ignore Back of the Head Guy. Update: This is John Cassavetes and Ralph Bell. Please congratulate Howard Mandelbaum (Monday’s mystery guest), Julie Merholz (Monday’s mystery guest), Don Danard (Monday’s mystery guest), dlhartzog (Monday’s mystery guest), Jenny M. (Monday’s mystery guest), Rick (Monday’s mystery guest), Sarah (Monday’s mystery guest), Earl Boebert (Monday’s mystery guest/wrong movie) and LC (Monday’s mystery guest). And our mystery woman for Wednesday is also on the phone. Update: This is Kathleen Maguire. It seems everybody is on the phone in this movie. Please congratulate Julie Merholz (mystery movie, Back of the Head Guy), dlhartzog (mystery movie, Back of the Head Guy), Mike Hawks (mystery movie, mystery guests), Howard Mandelbaum (mystery movie), Roget-L.A. (Monday’s mystery guest), LC (mystery movie, Back of the Head Guy) and Valley Dave (mystery movie, Back of the Head Guy). Note: Several people (apparently after consulting imdb) suggested that Tuesday’s Hat Guy was V.A., who is in the mystery movie, but has a different role. Someone else suggested W.L., who is also in the movie, but has a different role. And for Thursday we have a mystery woman. Please congratulate James (mystery movie and Monday’s mystery guest), Julie Merholz (Wednesday’s mystery guests), dlhartzog (Wednesday’s mystery guests), Mike Hawks (Wednesday’s mystery guests), Howard Mandelbaum (Wednesday’s mystery guests), Jenny M (mystery movie and Wednesday’s mystery guests), Barbara Klein (mystery movie and all mystery guests, including R.B. on Tuesday) and Mary Mallory (mystery movie, Monday’s mystery guest, Back of the Head Guy and Wednesday’s mystery guests). And for Friday, we have two utterly non-mystery guests. And Sidney Poitier and Jack Warden. I’d say it’s Robert F. Simon. Robert F. Simon, Captain Newman, M.D. Just a guess, but he looks like that favorite of fifties sci-fi, authority figure John Zaremba. Well, it’s Robert F. Simon, and he’s in uniform (unsurprisingly) so my guess is “The Rack” with Paul Newman. This is Robert F. Simon. Robert F. Simon for monday and John Cassavettes today make this EDGE OF THE CITY 1957. (ignore back of head guy) Is that John Garfield? I couldnt resist trying. why don’t you tell us monday’s name? I do that on Saturdays. I can tell you Friday’s name: Webb. And Clifton’s was Web, only one b. I think they would have hated one another on any day. Aha! This is The Edge of the City (1957) w/John Cassavetes (back of head guy), Sidney Poitier & Jack Warden. Is Tuesday’s hat-wearer Les Tremayne? Kathleen Maguire and Ruth White. On the phone: Kathleen Maguire and Ruth White. Monday’s guy took me forever, I could hear him talking, but no name. He’s Robert Simon and the film is EDGE OF THE CITY. John Cassavetes is back of the head guy, and is that Roy Glenn with him? Ruth White and Kathleen Maguire today. Monday = Robert Simon, Tuesday = the back of John Cassavetes, Wednesday = Kathleen Maguire presumably talking to Ruth White, Thursday = Ruby Dee in “Edge of the City” from 1957. 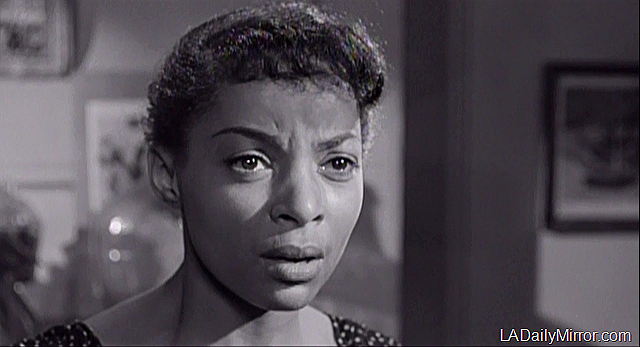 It’s Ruby Dee on Thursday, and possibly the back of John Cassavetes’ head a couple of days ago. Edge of the City? Okay. I’ll give this another shot. EDGE OF THE CITY. Ruby Dee Thursday and Sidney Poitier and a young! Jack Warden today. Friday’s Gimmes: Sidney Poitier and Jack Warden. Film: Edge of the City. Back of the head guy on Tues is John Cassavetes. Wed first actress on the phone is Kathleen Maguire. Wed second actress on the phone is Ruth White. Thurs is Ruby Dee. Friday is Sidney Poitier with Jack Warden. Movie is Edge of the City. I guess this is Edge of the City with Sidney, Ruby Dee, and Jack Warden All week I had thought the back of the head belonged to Henry Silva but I suppose if is John C.
A difference of opinion is shared by Sidney Poitier and Jack Warden. EDGE OF THE CITY  shows a vicious fight between Sidney Poitier and Jack Warden using those metal hooks. Sidney had to defend himself A LOT in the 50s and 60s. See, e.g. NO WAY OUT  with Richard Widmark.